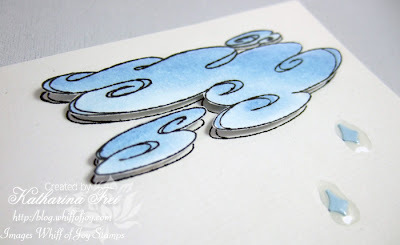 The funky cloud is a brand new stamp designed by Elisabeth Bell for Whiff of Joy Stamps. Yes, there will be a new release of fabulous new images soon. I simply couldn't resist to tease you a little bit *giggles*. The sentiment is from the general sayings collection. I scored a line above and below it with my ScorPal. Die verschnörkelte Wolke ist ein neues Motiv designed von Elisabeth Bell für Whiff of Joy Stamps. Ja, es wird bald einen neuen Release mit neuen Motiven geben. Ich konnte mich einfach nicht zurückhalten euch schon jetzt einen kleinen Vorgeschmack zu geben. Der Text ist von der gebräuchliche Texte Kollektion. Ich habe darüber und darunter mit meinem ScorPal je eine Linie gefalzt. 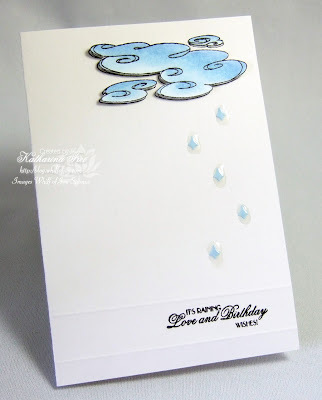 I stamped the cloud directly on my card base one time and another time on whisper white cardstock from SU. I coloured the second cloud with Copic Sketch Markers and cut around it to adhere it over the first cloud with stamping dimmensionals from SU. The "raindrops" are from a cuttlebug flower die, I put some crystal effects over them. Ich habe die Wolke einmal direkt auf meine weisse Kartenbasis gestempelt und ein zweites Mal auf whisper white cardstock von Stampin' Up. Die zweite Wolke habe ich mit Copic Sketch Markern coloriert und ausgeschnitten. Dann habe ich sie mit Abstanshaltern über die erste Wolke geklebt. Die "Regentropfen sind von einem cuttlebug flower die. Ich habe sie mit crystal effects von Stampin' Up bestrichen. Tomorrow is a huge birthday party at the Cute Card Thursday challenge blog. You won't miss it! We'll have a lot of prizes and a special Guest Designer. Morgen steigt eine tolle Geburtstagsparty auf dem Cute Card Thursday challenge blog. Es gibt einen Haufen Preise und einen speziellen Gast Designer. Oooh I can't wait for the new release! I'm so excited to see the new stamps!! I'm sure we will all love them, but please don't tease us any more, cuz I don't think we can handle it! LOL!! Love the card you made, great idea to score a line above and below the sentiment! Looks fab!! Super card, look forward to seeing more sneak peeks. My stamps arrived this morning, thank you for fantastic service. 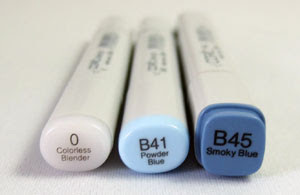 Looking forward to inking them up. Oooooo, I can hardly wait!! OHHH I can't wait either! Just loving playing with the one's that I have already! Oooh you are such a tease Katharina!! I can't wait to see the new stamps. Oh wow, I can't wait! You are such a tease!!! If the new set is even half as fab as the Spring Set, I'll be in heaven. ich hab doch keine Geduld,aber ich freu mich schon riesig wenn man was von den neuen Stempeln sehen darf. I should have guessed you'd be teasing us. I can't wait to see what else will be released. I'm so excited ... I just can't hide it ... (Thank goodness you can't HEAR me sing that, lol). I'll be close to the front of the line when these new ones are released, thanks for the "Sneaky" peek, Katharina ... can't wait.